It’s a point of pride for me that we’re an employee-owned company. We have been since 2000, and almost everyone who works here is a shareholder. 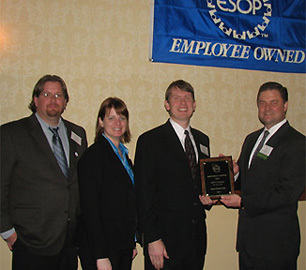 So it was a pleasure to hear that we’d won the ESOP Association’s Southwest Chapter 2008 ESOP Company of the Year award. On March 7, Cisco-Eagle’s ESOP committee members were presented this award at the association’s Spring Conference & Awards Dinner. Present were our ESOP Advisory Committee Chairman Randall Chamberlain, along with members Anne Miller and William Ellwood. With this award, we’ve been nominated for National ESOP Association company of the year. We’ve improved our company’s performance since we became employee-owned, and that’s no accident. Anyone who’s ever researched it understands that employee-owned companies outperform their peers. Some say that’s because people start to have a direct financial interest in the success of the company they partially own, and that’s true. But I think it goes beyond financial rewards. It’s about a unified purpose; we all own this thing; we all understand that the way we spend our days helps everyone around us, our customers, and our families. That translates to people who are concerned with more than just the work they do directly. Guys who turn wrenches on conveyors in the field know the intricacies of our bottom line numbers. People who design warehouse systems are also designing ways to more effectively service customers, but also understand how they affect every other part of the company. It’s a unity thing. Our ESOP advisory committee worked hard to get us in play for this award, and we’re all grateful for that. We’ll have more details on this when they are available.